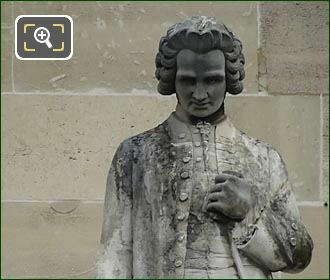 Again we were looking at the Aile Turgot wing of the Musee du Louvre in the 1st Arrondissement of Paris, when we took these high definition photos that shows a statue of Jean Jacques Rousseau, which was sculpted by Jean-Baptiste Eugene Farochon. As you are within the courtyard called the Cour Napoleon looking at the Aile Turgot wing, you will find this statue of Jean Rousseau located on the first level balustrade and this is the second statue from the right hand side of the facade, which was put in place in 1857 on the former Palais du Louvre. 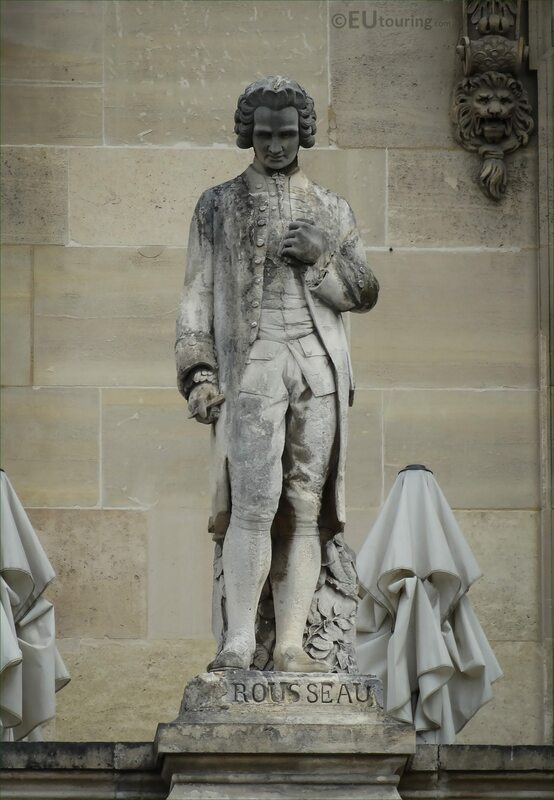 Now this HD photo shows the stone statue of Rousseau, which was produced by Jean-Baptiste Eugene Farochon, who was born in Paris on 10th March 1812, and becoming a French sculptor, engraver and medalist, he won the Prix de Rome residing at the Villa Medici for three years before returning to Paris and becoming a Professor at the Ecole des beaux Arts and passed away on 1st July 1871. 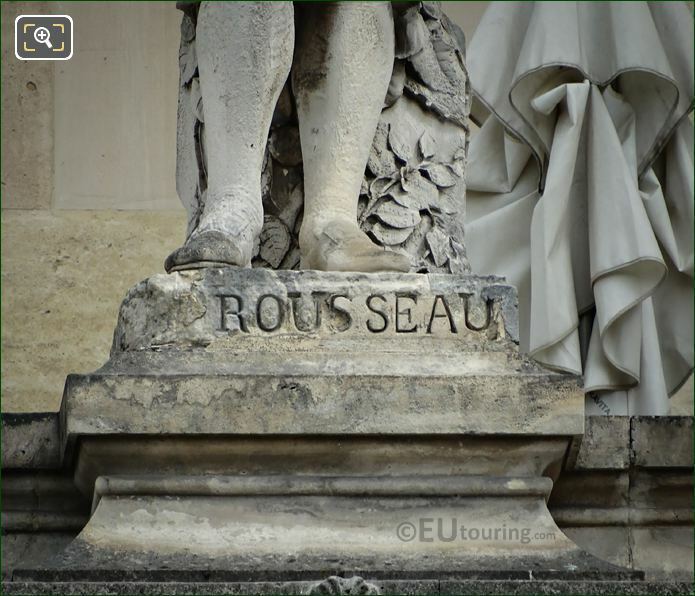 So this last image shows a close up of the base of the statue dedicated to Jean-Jacques Rousseau who was born on 28th June 1712 in Geneva and became a philosopher, writer, and composer. 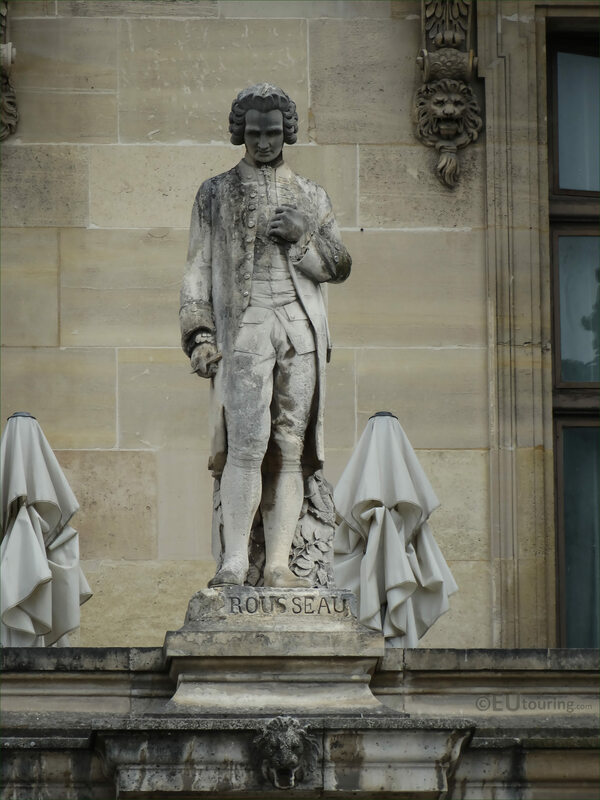 And it was his political philosophy that influenced the Enlightenment in France and across Europe, as well as aspects of the French Revolution and the overall development of modern political and educational thought, yet he was also a composer of music and classed as a national hero, his remains were removed from their original burial site and placed within the Pantheon in Paris in 1794, which was 16 years after his death.